My personal business plan is to always carry no month-to-month credit card debt and pay only cash for my cars. As an airplane owner, I continue this fiscal responsibility, and am overjoyed with the Cherokee 235 waiting out at the Eugene Airport. 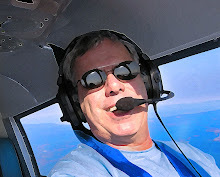 But like all pilots, I sometimes long for the speed and flight levels capability that comes from turbine power. But in my realistic world, I may never actually own a jet. That is, until I take a page from W's playbook and use "fuzzy math" to buy it. 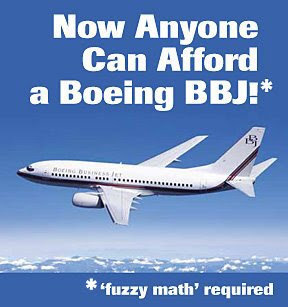 So here's the deal: While I'd love a HondaJet, why settle for one when I can buy a Boeing BBJ? All I have to do is hang out in a cloak room with some GOP cronies who knows someone who knows someone who has access to the endless Chinese financial money pit. I then get those BFFs to trade say a million well-paying industrial jobs to the Chinese in return for a loan to buy the BBJ. Throw in the Empire State Building and I can gold plate the lavs in my new jet. What..pay it back? Are you insane? I have no intention of paying the Chinese back for this money because my "term" is up soon and after January 20th, 2009, it will be someone else's problem. See, easy as pie. Just let Bush's fuzzy math buy your next airplane. Damn, why didn't I think of this before? CNN - 09.27.2000: "President Clinton announced Wednesday that the federal budget surplus for fiscal year 2000 amounted to at least $230 billion, making it the largest in U.S. history." CBS News - 09.09.08: "The federal government will run a near-record deficit of $407 billion for the budget year ending Sept. 30, 2008, according to the latest Capitol Hill estimates." What was that you guys in Fresno were saying about DEMOCRATS spending too much? That's a $644 billion dollar NEGATIVE swing with Bushie/GOP at the helm. This is just the budget deficit, and not the national debt, which now stands at $9,641,958,316,953.31. Don't EVEN try and figure out how much of that gigantic number you personally are on the hook for, because it is repulsive to know we each owe an estimated $31,639.17 according to this site. So when you want to buy that jet of your dreams, finance it the way Bushie finances everything...with garbage loans written by Wall Street whiz kids with zero ethics and even less moral fortitude. And if you vote for the "hero and the hottie" [as the right wingers are calling McCain/Palin], we are all so screwed.